Last edited by Koub on Fri May 18, 2018 10:22 am, edited 1 time in total. And input switching as well. What I find especially annoying is that it is very hard to remember which pipe will be for what liquid. It is very hard to deduce that from the order of the ingredients in the recipe, because, with respect to the order of the ingredients, the position of the individual liquids is not consistent; chemical plants behave very differently when compared to refineries. 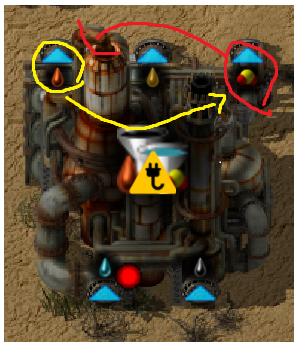 For example, if you rotate the chemical plant/refinery so that the input pipes are to the top and the output pipes are to the bottom, then, with the chemical plant, the first ingredient of the recipe will be in the left input pipe and the second one will be in the right input pipe. However, with refineries, it is the exact opposite: The first ingredient will be to the right and the second one will be to the left. This inconsistency is very confusing. Therefore, I am strongly in favor of fixing this inconsistency. One way to do so would be to allow the user to change the order of the pipes. An interesting thing is that a long time ago the order in which ingredients apeared for a recipe was changed to be defined by the order in which they were declared in the recipe. This was recently upturned, but it broke factories that used fluids, because they were suddenly in a different order when you loaded your savegame. I don't sugest that this behavour should change, or go away, however, it wouldn't be as important as it is now if you were allowed to choose which input/output could be used for which fluid. Although I don't have a solution to sugest for this problem, I do believe it is something that can be done.